Today we interview Melanie Sklarz, author of the DOSE of Creativity blog and co-contributor with me on Dee Wilcox’s fabulous, now-retired Creative Perch blog. 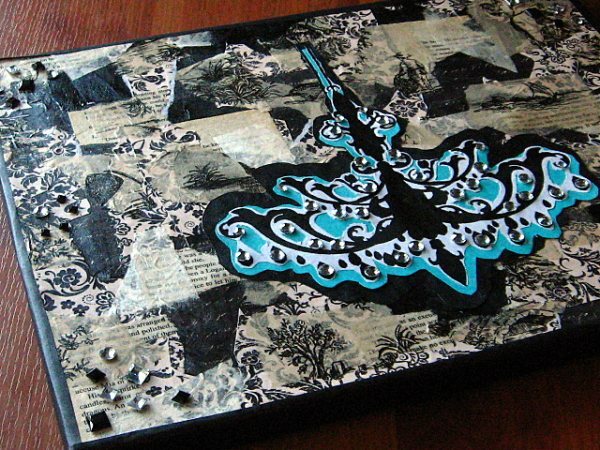 Melanie works in two very different artistic disciplines: collage art and jewelry-making. She’s also doing quite a bit of blogging and other writing these days. I think you’ll enjoy her perspectives on the creative process and how her work as a blogger, collage-maker and jewelry-creator all feeds her creative whole-mindedness. If, after reading the interview, you’d like to see more of Melanie’s work, you can check out her Dose of Creativity Designs blog or her Etsy online shop. My current creative pursuits vary widely, but I’ve been a collage artist for as along as I can remember. I love paper and imagery, and even more than that, I love synthesizing ideas, which collage allows me to do. 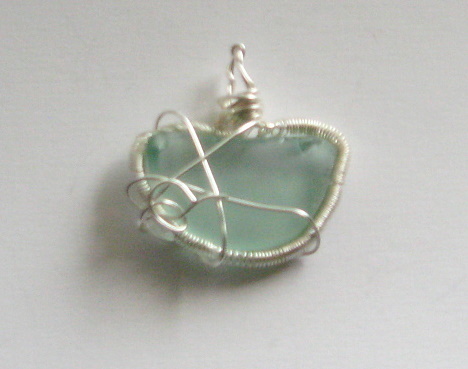 A couple of years ago, though, I became enamored with collecting beach glass and creating wire-wrapped pendants. Jewelry design is something new for me. I like collage because it tends to be messy and spontaneous; jewelry design is very precise and detail-oriented. It’s really nice to use both my analytical side and my creative side. I tend to fall somewhere in the middle and consider myself whole-brained anyway. 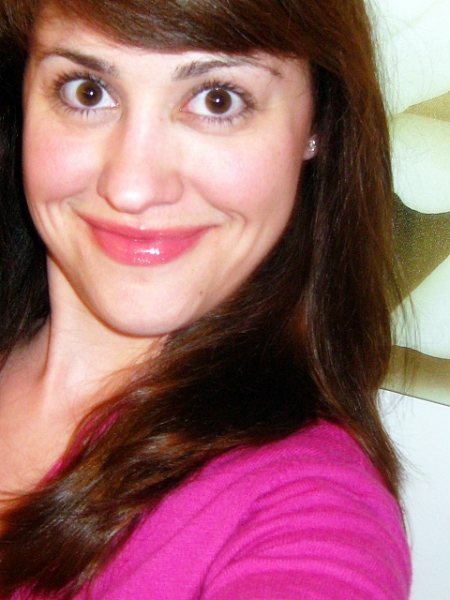 I also author my blogs and write professionally for other bloggers. Before that, I’d never thought of myself as a writer, but blogging has allowed me to develop and hone that skill. I don’t think I am the best writer out there, but I am definitely getting better at it every day. Writing has become a creative expression for me that I thought I would never enjoy and now I can’t wait to do it every day. Finally, due to years of work as an educator in architecture and fine arts museums, I still consider myself a teacher. I teach a couple of times a yea,r usually working with kids to create culturally-based art projects or helping parents to raise creative children. 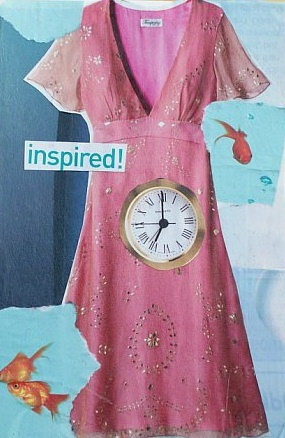 One of Melanie's collage works. I have a degree in Art History and was required to take several studio classes as part of the curriculum. Those studio classes changed my life in a dramatic way because they gave me permission to BE the artist instead of just studying the lives of other artists. Since then, I’ve always had creative projects going on the side. Creating art is very therapeutic for me, especially during difficult times. As I mentioned earlier, my first career was teaching in museums. It sounds like a glamorous and creative field, but I found it to be quite the opposite. After doing it for many years, I was completely burned out. One day I decided to pack up everything and leave my career and the city I was living in to return to my hometown to be closer to family. During that time, I had little idea of what I wanted to do with the rest of my life, so like other challenging times before that, I turned to art and exploring my own creativity. I realized I had been encouraging everyone else’s creativity for years but not my own! I began by taking art workshops that I would have never had the time before to take, like mail art, collage and jewelry wire-wrapping. It helped me to develop my confidence and define a path for my future. So for me, a combination of formal and informal classes worked best while I was finding my own creative voice. Not too long ago, I had this giant a-ha that a creative block, or what we refer to one as, is actually part of the creative process. Too often people use this idea of the creative block as this horrible and paralyzing concept, but for me it’s just a way to work through my ideas. If I am not creating, then maybe it means I am not supposed to at that moment. To me, it often means that I should be exploring new connections in my project or sometimes it just means that I need to quiet my mind and wait for the idea to emerge. Other ways that I have found inspire my creativity are walking and yoga. Both of these are wonderfully mindful practices that I encourage other artists to take up. Some of my best ideas have come when I am just focusing on being in the moment while also physically in motion. An example of Melanie's wire-wrapped jewelry. I am going to make a big announcement now about my future, something that I have told very few people, except those close to me: this summer I am returning to school, exactly ten years after I received my MA. I’ll be studying graphic design and interactive media. It is something that I am terribly excited about but also extremely terrified about. Just about 6 weeks ago, a good friend, who knew I was still struggling to define my future, suggested I look further into combining my passion for the visual with my professional experience managing a website and social media marketing campaign. Similar to the creative block a-ha, I felt like the perfect idea just fell from the sky at the right time. I’ve already registered at a local school and am now preparing to start classes this summer. Recently, I’ve done several commissioned collage art pieces. It can be a welcome relief when someone says, “this is what I want and this is how I want it to look.” It’s still a struggle though to come up with that final project for them but I also find there is a lot less anxiety about it too. However with my own projects, I tend to spend way too much time thinking and analyzing them, sometimes to the point where I don’t even begin them. I am trying to be less cerebral about my projects and am working on letting my intuition guide my decisions. For example, this year I have started a sketchbook challenge on my art blog. Each month, I give myself a theme then I work through it by creating these very spontaneous collages. I am also just inspired by random ideas and objects, so if I find an intriguing piece of paper or unique piece of beach glass, I’ll want to create something from it. I tend to be very process oriented, so I love playing with ideas and objects and synthesizing them. I found a huge shift in my creative voice when I stepped out of my comfort zone and tried a new medium. I had always worked with paper and mixed media to make these two-dimensional collages. Then I tried creating jewelry, which is really this precise three-dimensional art form. To me, they are like mini-sculptures, which is completely new for me. By making that small shift in perspective, I was really able to open up and become more fulfilled in my creative projects. Often times, artists will get stuck in a style, medium or even size, so I encourage them to step out of that role they’ve created for themselves and embrace something new, whether it is a process, a material or medium. I realize that most artists create a body of work that is similar to make it more sellable and that is fine. What I am suggesting is to get out of your comfort zone in the studio and just play a little with new ideas, even if you are just creating small sketchbook collages, like I am in different themes. Melanie's collage avatar for her DOSE of Creativity blog page. Thanks so much Liz! This was such a great experience. I hope your readers enjoy it.